The Dyson Cyclone V10 Absolute. You have to hand it to James Dyson. In the late 1970s, frustrated with his home vacuum, he reinvented one of his own. And, the company continues to improve its products – such as the latest offering. The Dyson Cyclone V10 Absolute is lightweight, portable, compact-able or full-size, and cordless – exactly what you want to clean the interior of the car or the RV. 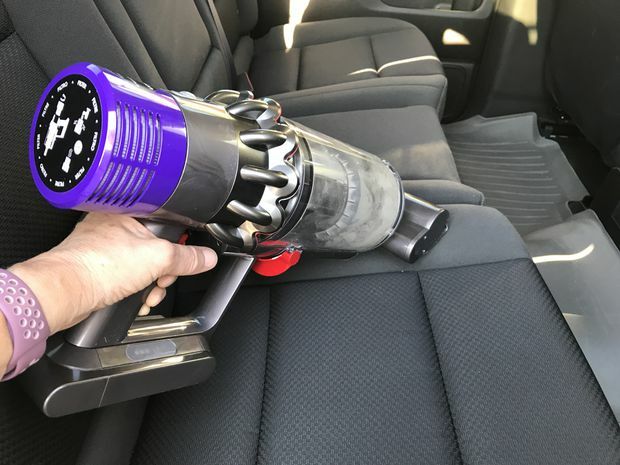 The sticker price may be intimidating, but this might be the only vacuum needed for the auto and the home. It’s the lightest vacuum with the best suction and is also the quietest. The tools easily pass the “lost candy test,” sucking up disgusting finds from between the seats. The soft roller head in the cargo area easily cleaned the floor mat. Switching out the mini motorized tool and the larger cleaner head for the carpet and seats pulled out the sand brought home from the beach. Different power settings on the motor can extend the cleaning time up to an hour. Easily enough time to clean the car and the trailer in one swoop. Score? 10/10. Can windshield shades really keep your leather seats cool?